SQL Injection occurs when data input for example by a user is interpreted as a SQL command rather than normal data by the backend database. This is an extremely common vulnerability and its successful exploitation can have critical implications. Even though Netsparker believes that there is a SQL Injection in here it could not confirm it. There can be numerous reasons for Netsparker not being able to confirm this. We strongly recommend investigating the issue manually to ensure that it is an SQL Injection and that it needs to be addressed. You can also consider sending the details of this issue to us, in order that we can address this issue for the next time and give you a more precise result. If you are not using a database access layer (DAL) within the architecture consider its benefits and implement if appropriate. As a minimum the use of s DAL will help centralize the issue and its resolution. You can also use an ORM (object relational mapping). Most ORM systems use parameterized queries and this can solve many if not all SQL Injection based problems. Monitor and review weblogs and application logs in order to uncover active or previous exploitation attempts. A very robust method for mitigating the threat of SQL Injection based vulnerabilities is to use parameterized queries (prepared statements). Almost all modern languages provide built in libraries for this. Wherever possible do not create dynamic SQL queries or SQL queries with string concatenation. There are numerous freely available tools to test for SQL Injection vulnerabilities. This is a complex area with many dependencies, however it should be noted that the numerous resources available in this area have raised both attacker awareness of the issues and their ability to discover and leverage them. 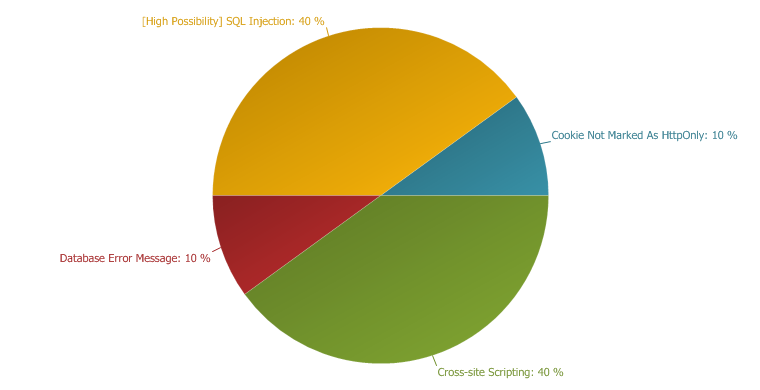 SQL Injection is one of the most common web application vulnerabilities. Netsparker identified a database error message. The error message may disclose sensitive information and this information can be used by an attacker to mount new attacks or to enlarge the attack surface. In rare conditions this may be a clue for an SQL Injection vulnerability. Most of the time Netsparker will detect and report that problem separately. Do not provide any error messages on production environments. Save error messages with a reference number to a backend storage such as a text file or database, then show this number and a static user-friendly error message to the user.